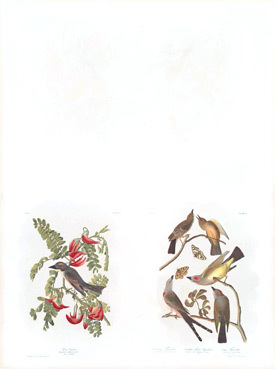 In 1858 or 1859 John Woodhouse Audubon entered upon an ambitious project, that of reproducing the Birds of America at one-half the original price, from the copper plates transferred to stone. Every plate was to be colored from the original drawings. The work was to be issued in forty-five numbers, forty-four of plates and one of text. Printed on seven double-elephant sheets, of the best quality for the purpose, 2’7 by 40 inches, each number was to contain two large plates, each occupying a whole sheet; two of medium size, each also occupying an entire sheet; and six of the smaller size, two on a sheet. The text was to be properly and scientifically classified so that, when the work was completed, the plates could be placed and bound corresponding with the order of text, in either three or four volumes. However the work was never completed, and only one volume containing 15 numbers of 1o5 double-elephant plates with 150 species was issued. The outbreak of the Civil War, aided, it is believed, by unscrupulous dealings of business partners, resulted in disaster. The publication had been attempted in association with Messrs Roe Lockwood & Son, New York, and the lithographers J. Bien & Company also of New York.2 The lithographer, Julius Bien (1826-1909), was born at Naumberg (near Cassell), Germany. He took part in the Revolution of 1848, one of the group of notable men brought to the United States by that cataclysm. He will be remembered also as the first great scientific cartographer in the United States. During the presidency of Pierce he produced maps of the new surveys of the West. His engravings and lithographs were of the highest quality. No copy of a prospectus prepared for American subscribers has been located. The one issued for English subscribers stated that the price of each number was to be £2 8s., or roughly $11. The forty-five numbers were to be issued for approximately $5oo, a price which was, as stated in the prospectus, half of $1,000, the price of the original work. The paper used for the publication does not have a watermark. The personal fortunes of Mrs. Audubon were seriously affected by the failure of her son’s attempt to reproduce the Birds of America. Her older son died in 1859 and the younger died in 1862, within two years after the failure of the publication. It became necessary for the mother to raise funds in the only way left open to her, namely to try to dispose of the original drawings and the copper plates of the Birds of America. The original drawings she was able to sell to the New-York Historical Society in 1863 for $4,000. The sale was a sacrifice both of the Drawings and my feelings, and cruelly to state nearly the whole of the proceeds past from me soon, for the claims on notes I had indorsed for my unfortunate sons. Now I have the Copper Plates entire of the “Birds of America” which I chiefly depend on for the support of myself and orphan grand daughter. She was not able to sell the copper plates and most of them were melted. *Plates 6-10 in Number 7 and Plates 7-10 in Number 8 have been misnumbered in the Bien edition.